People have varying degrees of ability to see and hear. Captions and transcripts make educational media accessible to those with a sight or hearing impairment. Others who benefit from captions and transcripts are people who speak English as a second language, those with learning disabilities, textual learners, people who have trouble concentrating, people in a work environment with background noise, as well as people using assistive technology. A transcript is a written or printed version of material originally presented in another medium. Podcasts, videos, and other audio files must include a transcript in order to be accessible to people who are deaf or hard of hearing. If you don’t provide a transcript for your audio files, you are discriminating against some people, preventing them from getting the information. You can hire an outside service to transcribe and caption your media, or you can do it yourself. AMARA – Upload a video and easily subtitle and edit the captioning (free). Dragon NaturallySpeaking dictation software (not free). 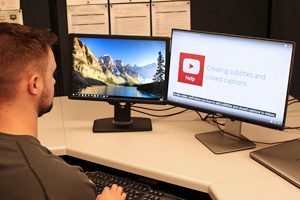 YouTube Captions and Transcripts – Transcribe and caption a video through a step-by-step process. Edit and upload your video (free). A quick, one page guide on how to do this can be found at NCDAE.org. VLC Media Player – Produce a transcription for your video using this open-source multi-media player with good editing controls (free). Communication Access Realtime Translation (CART) services provide the instant translation of the spoken word into English text using a stenotype machine, notebook computer and realtime software. The text produced by the CART service can be displayed on an individual’s computer monitor, projected onto a screen, combined with a video presentation to appear as captions, or otherwise made available using other transmission and display systems.